When I saw FLOYD NORMAN: AN ANIMATED LIFE I found my reaction to the film was split. On the one hand I fell in love with the film on a purely emotional level. This is a great feel good story about this guy who has managed to spend his whole life doing what he absolutely loves. His joy bleeds out of him and infects everyone around him. Emotionally this is one of my favorite and best films I've seen in 2016. However on an intellectual level I really liked the film but I had reservations. The result of this split is I’m going to do this in two parts. I know it will come off as strange but is the only way to fully do justice to the film. 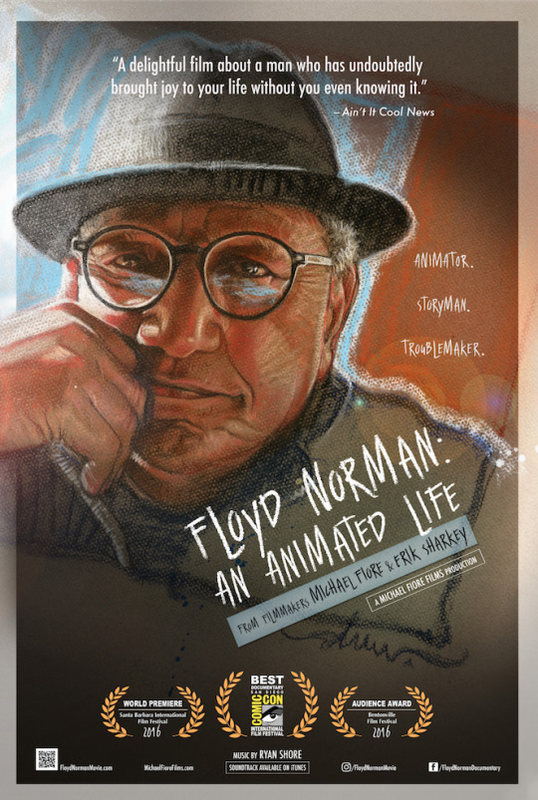 FLOYD NORMAN : AN ANIMATED LIFE is almost certainly to be on the Oscar short list. As much as I would think some weightier films might win the Oscar, I'm going to make a guess and say that the film will probably win the Oscar as well because this feel good film is exactly the sort of thing that Oscar voters go for, more so when it is about one of their own. The film is a celebration of Norman who started as a Disney artist in 1956 and, now some 60 years later, is still working at the age of 81. The film follows his days when as a teenager he worked on an Archie comics spin off and it carries through his off and on again time at Disney, the military, forming his own company, reporting on the Watts riots, working for Hanna Barbara and on through his Floydering and making everyone feel good today. It’s a glorious look at man who seems to have had all the luck in the world and is supremely nice and is well respected. I loved every minute of this film and stopped my viewing of the screener to fire off some emails to friends saying- essentially "I'm in the middle of this amazing film about this amazing person and that you NEED to see this" implying that the film will be like oxygen for them. I got some "yea sures", and then when my friends got to see the film themselves they emailed me back telling me how right I as. Trust me on this, the film is absolutely one of the feel good films of the year and it’s a must see. You absolutely MUST see this film because Floyd and his view of life will make you feel good. Despite making me feel all warm and fuzzy with a stupid grin on my face, my brain kept wanting to raise its hand and ask some questions. Don’t get me wrong I was loving and do love the film, but there are a couple of things in the film that are going to keep it off my best of the best for the film. First, there is no way you can no say the film is not hagiographic. The film is most definitely a celebration of Norman but there doesn’t seem to be a down side to the man. (no seriously) No one is this nice. I mean other than his biting cartoons, there is no sense of him not being a great guy or having a downside. I wouldn’t mention it except the film keeps saying he can be a "troublemaker", but we never really see evidence of it. Norman’s life is largely “great” with other than his scrambling for jobs in the 70’s and 80’s things sort of were good- or were kind of fun the way everyone tells it. Yea his marriage broke up, but they even after that he and his ex remained friends. There is no conflict in his life other than Disney firing him at 65 for no real reason other than being 65. The film is also weirdly lacking in details about what exactly Norman did. Yes we get some discussion of his work on various films but other than the Trust in Me sequence in JUNGLE BOOK there is very little discussion of the details of what he did for Disney or Hanna Barbara or Pixar or anyone else. I know some of what he did because I'm an animation junkie and I've been running across his work all my life, but for people who don't know they are going to wonder what did he do that has resulted in a fifty plus year in animation? What made him a survivor? We don’t know. With films on animators like Chuck Jones or Frank Tashlin or Tex Avery or Ub Iwerks we got a sense of that, here not so much. I suspect that since the film was made outside the mainstream, especially outside of Disney brand and the fact that the film is a full bore attack on the ageism that Norman couldn’t talk about in his book (Disney wouldn’t approve material if he kept in in) limited the use of clips which would have illustrated his career better. While we can find the material else where it would have been nice to have a little bit more of a discussion and more clips. And don’t get me wrong I love the film, I just want to love it more. A must see when it hits theaters Friday- because you want to be on the ground floor on this films run for the Oscar.